The unique Lexus Sport Yacht concept was recognized with a special award by Japan’s “Boat of the Year” committee at the Japan International Boat Show in Yokohama today. While accepting the award today at the Japan International Boat Show, Shigeki Tomoyama also announced plans to produce a future Lexus premium yacht for sale worldwide. Connected services using the company’s new Mobility Services Platform (MSPF) will provide security, smartphone integration, remote diagnostics and maintenance and other services. Specifications, pricing and other details of the 65-foot yacht will be announced at a later date. 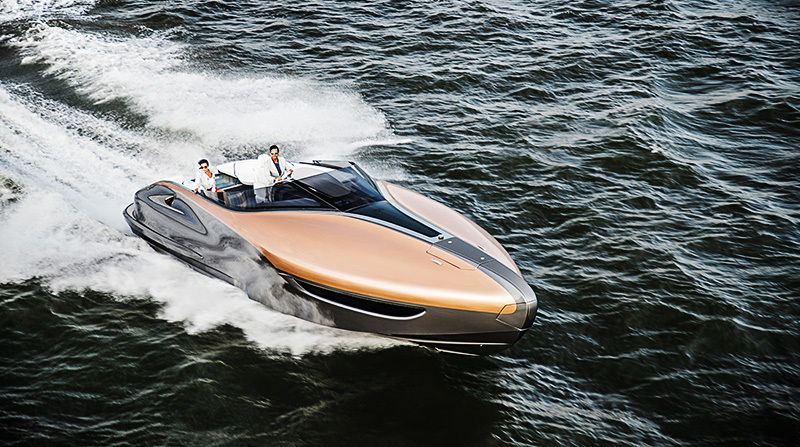 The Lexus Sport Yacht concept was a one-of-a-kind vision by Lexus Design. Engineered by the Toyota Marine Division, a single running concept was built in partnership with Marquis-Larson Boat Group of Pulaski (Green Bay) Wisconsin, USA. The Japan International Boat Show is the largest exposition of the Japanese marine industry, held this year from March 8 to 11, 2018, at the Yokohama Bayside Marina and Pacifico Yokohama near Tokyo. The “Boat Of The Year” awards are selected by a committee of 30 Japanese marine journalists. Toyota Marine, founded in 1990 and based at Laguna Gamagori in Aichi, Japan, is one of the largest makers of premium yachts in Japan. Toyota Marine’s Ponam lineup includes fiberglass sport-fishing boats from 26 to 30 feet long and luxury cabin-cruisers in 31- and 35-foot lengths with fully-welded aluminum alloy hulls, each powered by a marinized version of the turbodiesel engine of the Lexus GX 300d (3.0-liter turbodiesel 4 cylinder) or LX 450d (twin-turbo diesel 4.5-liter V8) luxury utility vehicles. Marquis-Larson Boat Group is an independent privately-owned company in Pulaski (near Green Bay), Wisconsin, that designs, engineers and manufactures the brands of Marquis Yachts and Carver Yachts and Larson boats. The pinnacle of their line is the Marquis 720 three-level luxury yacht with fiberglass reinforced plastic (FRP) hull, deck and superstructure. For more information please see www.MarquisYachts.com or www.LarsonBoatGroup.com. Para noticias y comunicados de prensa respecto a eventos globales, visite www.discoverlexus.com.